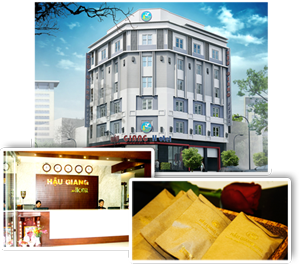 Hau Giang Hotel has a warm and cozy atmosphere and we offer the best possible price. We hope that the accommodations and service were to your liking, as complete satisfaction is our goal at Hau Giang Hotel. we will help you out in the best way we can so that you will be comfortable here, all the way from check in to check out. We are looking forward to your next visit and wish you the best in your business and personal endeavors. Restaurant are located at the Sixth floor. From here you can enjoy panoramic view city and Can Tho bridge. Restaurant offers absolute relaxing environment for dining, where you can enjoy variety of delicious cuisines. The Restaurant's Lounge is a place where guests can enjoy partying with special drinks and soft music. The hotel features different 54 spacious rooms and suites. All the rooms are well decorated and designed with facilities including air conditioner, hair dryer, internet access and cable TV.